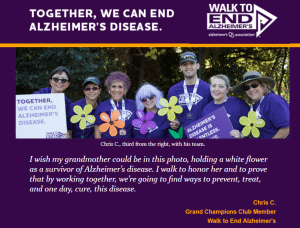 OPEN LETTER FROM CHRIS C. Grand Champions Club Member Walk to End Alzheimers. Of all the causes I support, Walk to End Alzheimer’s® is especially close to my heart. Each year in more than 600 communities around the nation, Walk participants carry purple flowers to show they’ve lost someone to Alzheimer’s. People living with the disease carry blue flowers. Those caring for someone carry yellow flowers, and those not directly affected carry orange ones because they know that everyone is at risk for Alzheimer’s. I can’t wait for the day when we see the first survivor of Alzheimer’s carry a white flower. I can’t wait to see millions of them! Don’t miss your opportunity to help us make that beautiful day happen. Take this final opportunity in 2018 to register at alz.org/walk. The Walk for Beckley, WV is Saturday, October 13th. The Walk for Wheeling, WV is Saturday, October 13th. The Walk for Bluefield / Princeton, WV is Saturday, October 13th. The Walk for Morgantown, WV is Sunday, October 14th. The Walk for Charleston, WV is Saturday, October 27th.